A variety of nations are rep- resented within the Utah State University Eastern student body. 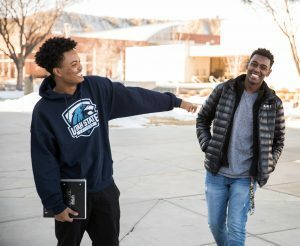 Among these international students are Samuel Woubshet and Beruke Mekasha, two freshman photographers on the Eagle newspaper staff who made their way from Ethiopia to the United States in pursuit of a better life. The two friends met each other in Las Vegas during their senior year of high school. Both Woubshet and Mekasha saw distinct changes in themselves after moving from their homeland and found that the opportunities available in America made the difficult move from Africa more bearable. Woubshet was impressed by the school system here. His main purpose for immigrating was his desire for a better education. In Ethiopia, the government decides what and where students study. Unless they have the money to splurge on private education, these students are given a test in their senior year of high school that determines what major they will pursue and which college they will attend. Luckily, Woubshet moved to Las Vegas for 12th grade and missed taking the exam. Mekasha avoided being placed into an unwanted college pro- gram as well. His father wanted a more serious life for his kids, and America was the answer his mother chose. However, as an eight-year-old, the improved edu- cation system wasn’t as attractive as the arts. From a young age, he showed an aptitude for music, dancing and art. An undying love for music with drives his desire to become a re- cording artist and music producer. He is learning to play the guitar and the piano, but relies mainly on his poetry. He believes it is more important to learn by doing, focusing more on emotions and subliminal messages than things he learns in class. He aims to become like Chance the Rapper, J. Cole, Amine and Smino. Artists like that, he claims, have mastered what he considers the philosophy of music, it captures the essence of emotion and lets it tear you apart until you can figure out how to deal with those feelings. By listening to their music, he is able to pick up on their methods and implement them in his own music. Woubshet also appreciates the success that can be found in this country, but he noticed a differ- ence in values between America and Ethiopia. He realized that because Americans tend to have a more casual atmosphere in the family, there is a lack of respect. That’s one of the things he misses most from his country. Overall, though, both students are grateful for the lifestyles they’ve adopted here. They look forward to what the future has in store for them. Woubshet will transfer up to the Logan campus of USU at the end of the school year to pursue a mechanical engineering degree, and Mekasha plans on transferring to Grand Canyon University in Phoenix, Arizona, to follow his dream of music production.